I'm working on creating a comic book, which I hope to publish next summer, so I thought I would share my efforts with the community here. Old timers may remember that several years ago, I decided to make my own Creimebuster series, continuing his adventures where Boy Comics #119 left off. 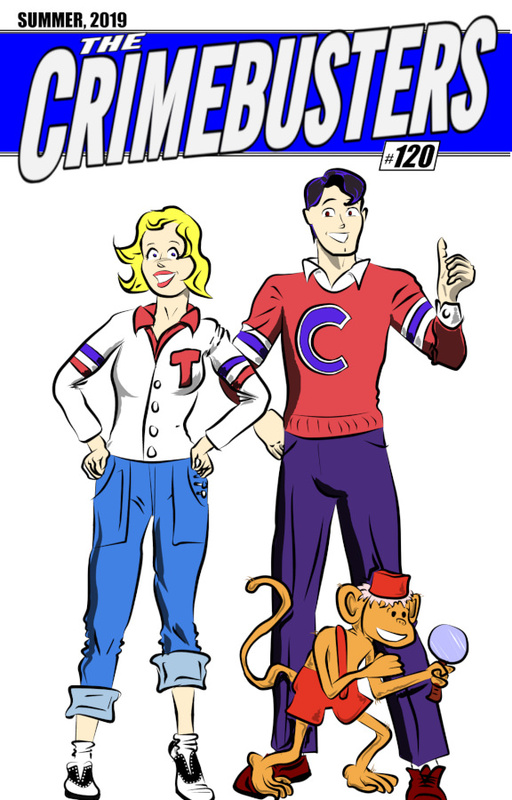 Since Both Crimebuster and Boy Comics are in the public domain, anyone is free to do this. At that time, I shared a couple pages, but after working on it for a little bit, I gave up. Well, now I'm back. I've started mostly from scratch, though some of the basic story and character ideas are still present. I learned a couple big things from my last attempt, though. First, it was too serious. The subject matter was more serious than I enjoyed writing, and the art style was more serious than I was capable of rendering with my limited skill set. This time around, I am having more fun with a story that, while still a murder mystery, is far less grim and more adventurous. I also have adjusted my art style, embracing an Archie style that allows me to get across things like facial expressions with much more ease than before. Secondly, my process was flawed. I was trying to complete each page one at a time before moving on to the next page, which I know works for lots of people. But not me - I felt bogged down, and slow. This time, I've decided to use a classic comic book production line style. I'm doing the entire book one phase at a time - plotting, thumbnails, breakdowns, line work, inking, dialoguing, etc - going through all 28 pages of the story before moving on to the next step. Right now I am at the line work phase, having already done full breakdowns for the entire story. It feels much more managable and steady to me this way. So what is the series about? The Crimebusters basically picks up where Boy Comics #119 left off. 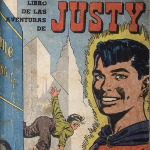 It's 1956, and Crimebuster - aka Chuck Chandler - is at college, working to get his degree so he can one day join the police force. But even in a small college town, trouble seems to always find Chuck... Trouble with a capital T, that is. Enter Trixie Trouble, an intrepid girl reporter for the school newspaper who dreams of becoming a professional private eye. When one of the school's most respected professors turns up dead, Chuck and Trixie must work together to discover the truth behind his death. Was it suicide, like the cops claim? Or did he bring back more than just rare artifacts from his recent archaeology trip to Peru — like an ancient curse? My main influence with this series is the original Life with Archie series, as well as teen detective stories in general. Scooby Doo and Archie's Weird Mysteries is the vibe I am going for, and characters like The Three Investigators, Veronica Mars and (obviously) Trixie Belden are big influences. My plan is for this issue and future issues to be complete, self contained stories; since they take so long for me to make, I don't think it would be fair to ask readers to stay engaged for who knows how long in order for a bigger story to play out. However, I do have a larger arc in mind, which will incrementally build as a subplot as the series progresses. That's down the line, though. For now, I'm just trying to make one comic book, something I have always dreamed of. I love Crimebuster, I'm excited to introduce Trixie Trouble as his new partner, and I'm having a good time working on it. I expect it will take me until the end of March to finish this issue, if all goes well. Once it's done, I'm going to do a Kickstarter campaign for the series. We'll see! I'll be posting updates here for you guys, and I've also started a website for the comic, which you can find at crimebustercomics.com. I haven't shared any of this with anyone else yet, so I'm eager to see what you guys think! Here's an early draft of the splash page! This hasn't been inked yet, so it doesn't have any of the shading and textures it will have once I get to that step of the process (likely in February). I also really don't like the font for the dialogue here, so that will change as well, an I will probably continue to rewrite the dialogue to be less expository, something I always struggle with. This is a second draft of the dialogue - by the 5th it will probably start to be readable. As you can see, I tried to keep the classic Golden Age feel for the splash. It's a classic 3/4 symbolic splash, complete with the morality lesson text speech that Charles Biro used to write at the start of each issue. I wanted to keep this tradition, which I also think helps set the mood for the book. Since this is an ode to classic teen detective stories, having that old timey feel to the book is a positive. I love the Golden age look of the splash... These old first pages always brought drew you in and opened the door to a world of mystery and adventure. This will be one to watch! I'm now working on the line work for page 7. It's going a little slower than I hoped, but it's going. I'm heading on vacation in a week and a half, otherwise I'd expect to have the line work for all 28 pages done the last week in January. As it is, I'm looking at maybe February 10. I'm trying to just plug away, a little each day! My God, man. This is incredible stuff -- both the visuals and the concept itself. The one and only thing that's bothering me is the typeset lettering. There is such a warmth to your pencils that is thwarted by the expressionless work of a computer. Between your work and Ben's, there is such explosive talent here in this community. If you two ever decide you're interested, I could see this community crowd-funding its own US based comic line. 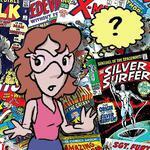 Crimebuster have you checked out Blambot, Nate Peikos site. There are free comic book fonts you can download (many for free) for lettering and still do lettering on the computer but not have the typset font? Thanks for the kind words everyone, the support definitely helps as I slowly work through this week after week! 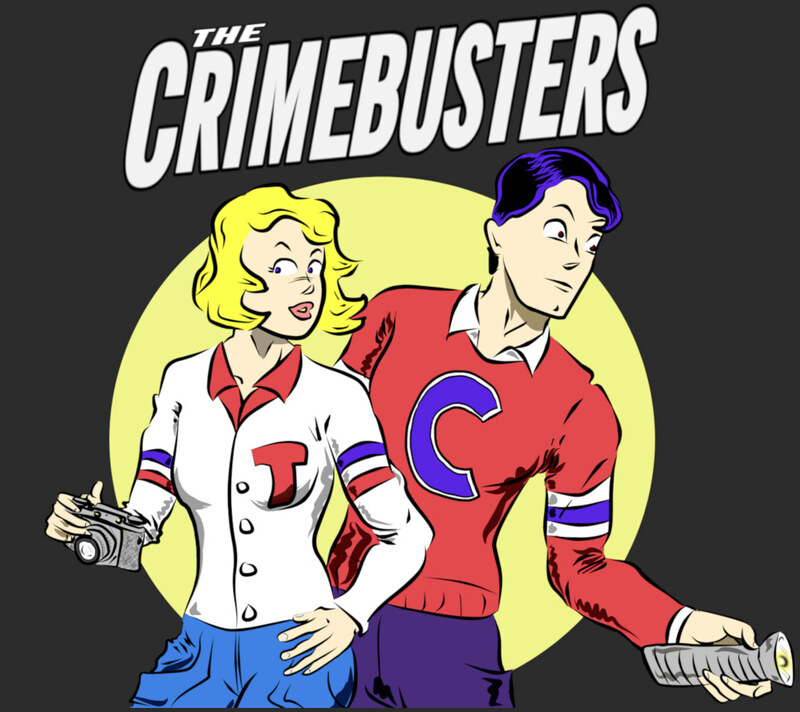 Crimebuster have you checked out Blambot, Nate Peikos site. There re free comic book fonts you can download (many for free) for lettering and still do lettering on the computer but not have the typset font? I have! The fonts on this sample page are almost definitely going to change, especially the dialogue font, which I hate. The font in the scroll speech - that's okay, I kind of like it. But the rest has to go. I have about 20-30 comic book fonts which I have collected from around the internet, including from Blambot. Figuring out which one to use is turning out to be really tricky, as they are all good, but slightly different. Picking the right font is pretty important, and affects the balloon size and placement not just throughout this issue, but maybe future issues, so it's a bit overwhelming. My plan is that at some point down the road - probably in January - I'm going to dialogue another page with more word and thought balloons, and then do versions of it with many different fonts, at which point I'll be posting them here to see what people think. If there's a consensus which font is easiest to read and looks best, that will certainly make my decision a lot easier! No new art to show off just yet — I am working on the line work for page 10, but with my vacation about to start, things have slowed down some. I also decided to bump it from 28 to 30 pages, so at this point I think I won't be done with the linework until mid-February. When I get back, I will have a lok at the linework for Page 4, which I think is pretty cool. For now, though, I have updated my production blog with the first part of a multi-part look about the process of creating my new character Trixie Trouble. This looks great, Scott. Really nice "Archie-style" artwork and very expressive too. Best of luck with the comic and keep us updated. I am finally back from my two week trip to Europe, and am getting back into the groove. I am hoping to finish the linework on Page 10 today and do some layout prep for page 11. These two pages are additions to the original script (well, restorations, really - I originally plotted them out, then cut them) so they are requiring extra work, as I hadn't done the prep work with these two that I did for the other 28. It's extra time spent, and is pushing back my timeline some, but I think it's worth it, as there are some valuable character moments in these two pages that I think will benefit the story. I originally cut this sequence as I decided the plot didn't need it, but stories aren't all plot, so I think this will pay off. In the meantime, here's a look at the linework for Page 4. 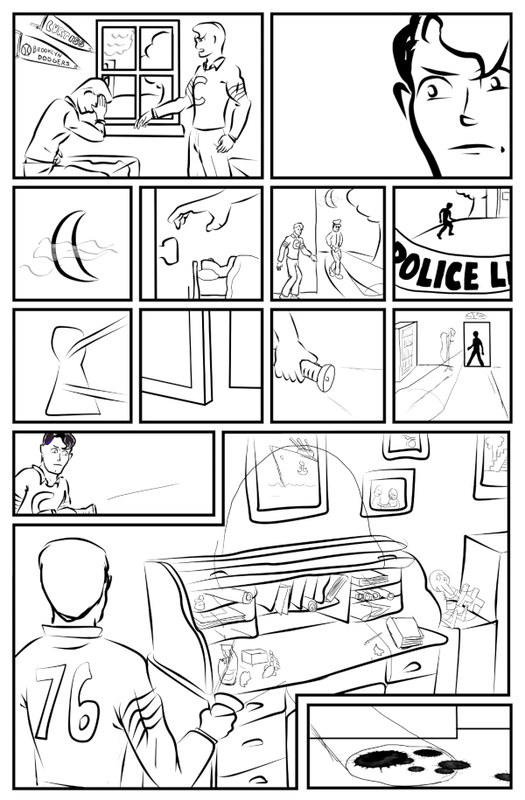 This will look very different once I get to the inking stage, as most of this page takes place at night, and in the dark, so there are a lot of blacks and shades to fill things in. Plus sound effects! This sequence, where Chuck sneaks out of his dorm to investigate a crime scene, was inspired by some of Steranko's wordless sequences of small panels - closeups on details in rapid succession to tell the story rather than sweeping splashes, or a bunch of exposition. 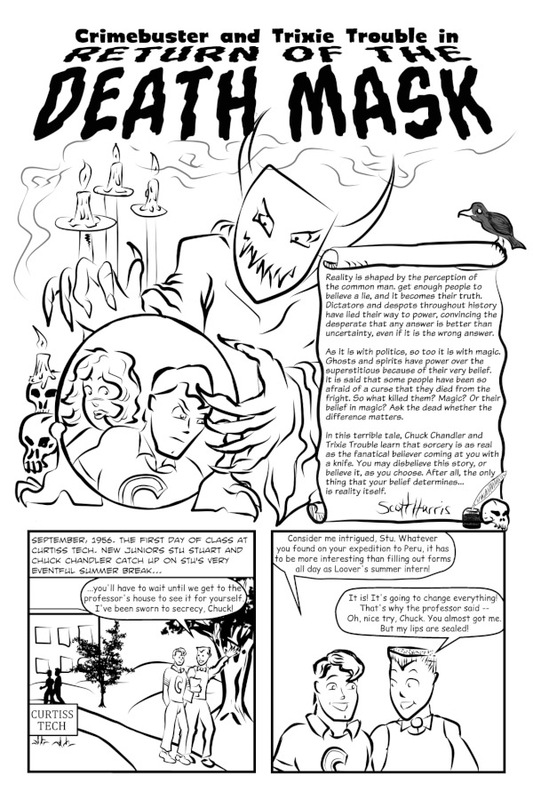 I'm pretty pleased with how it worked out - I think it looks cool, and will read better than if I conveyed some of this action through thought or word balloons. Just technically I don't like the lettering font for regular captions and balloons. I like it better than the mechanical lettering E.C. and Charlton used sometimes way back though, just I would have italics. Every little bit helps. The header title lettering is really good though. Yeah, I don't like the fonts either, they are pretty bad. I have about a dozen other fonts I am looking at, I just haven't figured out which one to use yet. When I get to the point where I need to decide — which will probably be in 6 weeks or so — i'll probably post some comparative samples here to see what people like. There was a site you could download fonts. I have one called Comic Sans MS that seems pretty good and can be bold and/or italic. It says it's a .ttf and OpenType. Possibly I could even email it. Comic Sans is a horrific font. There's even an online movement to ban it. I've no idea why it's called that either, since it's not something that I've ever seen in a comic. I'm pretty sure Comic Sans comes as standard with the Windows operating system though, so I expect Crimebuster has already got it.